Recent reports of a “Great Pacific Garbage Patch” in the subtropical waters of the North Pacific Ocean described a floating island as large as Texas—so thick that one could potentially walk on plastic debris for miles and miles. The image is misleading, and it offers false hopes of a straightforward (albeit expensive) solution: just scoop it up. • Debris in the surface ocean contained few particles made of certain types of plastic that are abundant on land, specifically polyethylene terepththalate, or PET, which most beverage bottles are made of. What is happening to that plastic? • Since 1986, the global production of plastics has skyrocketed, but the concentration of plastics in Atlantic surface waters has remained about the same. If the amount of plastics entering the oceans has also skyrocketed, what processes might be removing some plastics from surface waters? • The plastic particles showed evidence of being coated with living organisms. Are microbes or other tiny life forms digesting the plastics, causing them to sink, or are they sticking to the particles and being carried through the ocean like sailors on rafts? For their studies, the scientists took advantage of a remarkable dataset collected in an unorthodox way. Since 1971, the nonprofit SEA organization, based in Woods Hole, Mass., has been taking undergraduate students aboard its ships every year for a 12-week SEA Semester program. 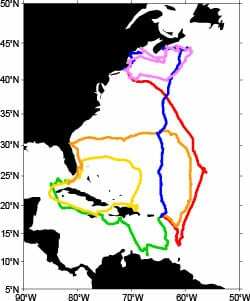 Thirteen years later, it began a standard practice for its students to sample along the same track each year, towing nets along the surface twice a day to collect biological samples and ocean debris. This unprecedented effort—roughly 64,000 pieces of plastic collected by 7,000 undergraduates from 6,100 net tows since 1986—resulted in a scientific treasure trove that researchers could glean to reveal long-term trends in ocean plastics over a wide area of the Atlantic and Caribbean Sea. In 1997, Charles Moore brought widespread attention to the problem of plastics in the ocean when he crossed the North Pacific Gyre in his catamaran Alguitaon the way back home to California from Hawaii. He found surprisingly large amounts of plastic debris and became an important advocate for cleaning up the oceans. 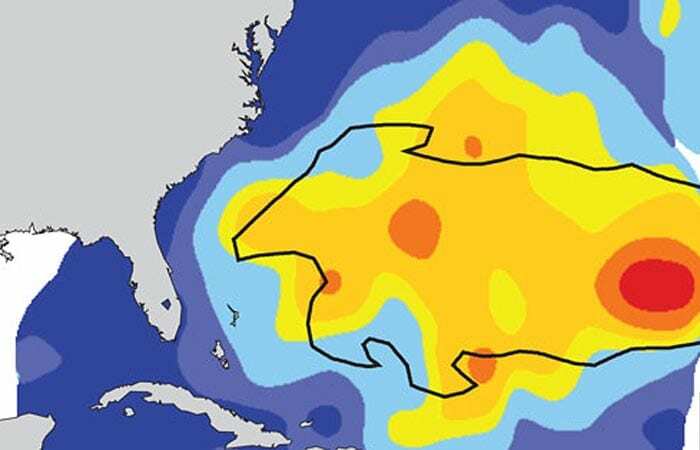 But high concentrations of plastic debris were first reported from the Atlantic Ocean, specifically the Sargasso Sea, by two WHOI scientists, Edward J. Carpenter and K.L. Smith Jr., in 1972. Aboard WHOI’s R/V Atlantis II, they collected, counted, and weighed all the plastic pieces collected in a net with a 1-meter-wide mouth that was towed at the ocean surface. Carpenter and Smith calculated concentrations of 50 to 12,000 plastic particles per square kilometer, collectively weighing up to 1,070 grams, per square kilometer. The highest numbers were obtained at about 34°N latitude in the Sargasso Sea. 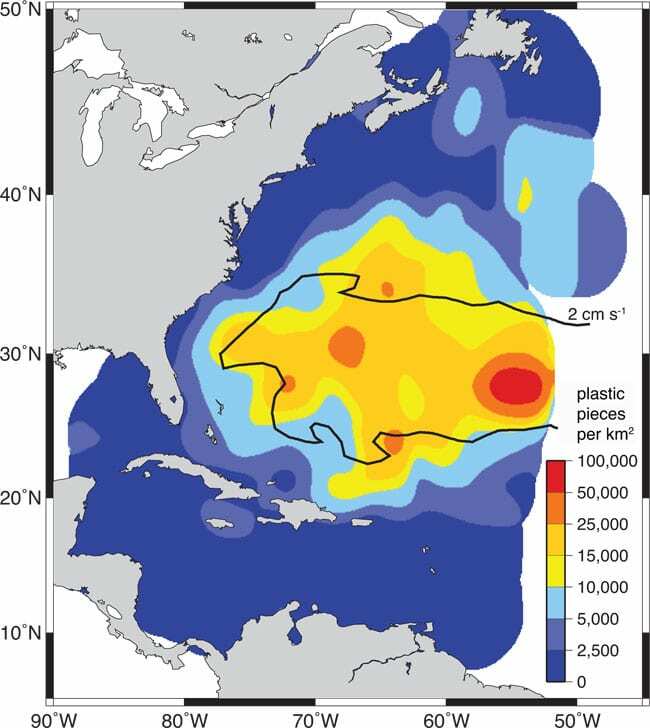 Later work showed that plastic debris was widespread throughout the northwestern Atlantic, and that densities could be much higher. For its routine plastic sampling, SEA incorporated methods comparable to those used by WHOI scientists in the early 1970s—tow a 1-meter-wide net through the surface and collect, count, and weigh the plastic particles trapped inside. But SEA scientists standardized the speed (2 knots, or about 3.7 kilometers per hour) and duration (30 minutes) of the tows. One tow generally covers 1 nautical mile (1.85 kilometers), or 1,850 square meters. The volume of water filtered through a net during a tow is staggering—about 122,000 gallons or 2,000 bathtubs full of water. 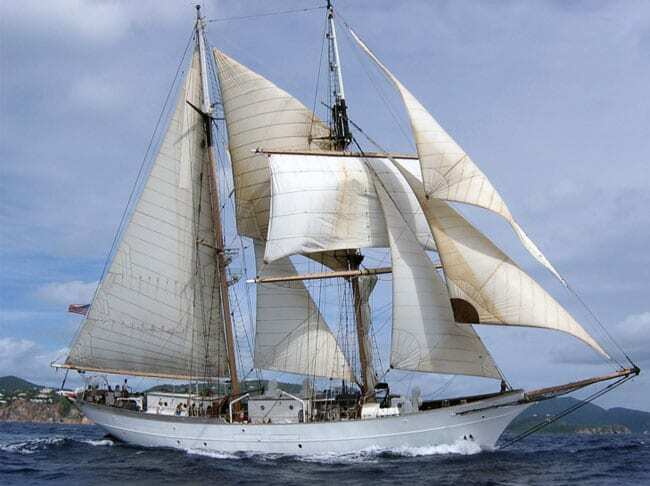 Assessing 22 years of data collected by SEA ships (initially the Westward and later the Corwith Cramer), the researchers found that more than 60 percent of the tows contained detectable plastic debris. Average densities rivaled those reported from the “Great Pacific Garbage Patch,” ranging from 1,400 pieces per square kilometer in the Caribbean to more than 20,000 pieces per square kilometer in the Sargasso Sea. The research team—Kara Lavender Law from SEA, Skye Morét-Ferguson and Giora Proskurowski, who held joint appointments at SEA and WHOI, Emily Peacock and Christopher Reddy from WHOI, and Nikolai A. Maximenko and Jan Hafner from the University of Hawai’i—reported their findings in the Aug. 19, 2010, online edition journal Science. Their paper will appear in the print edition of Science on Aug. 26. 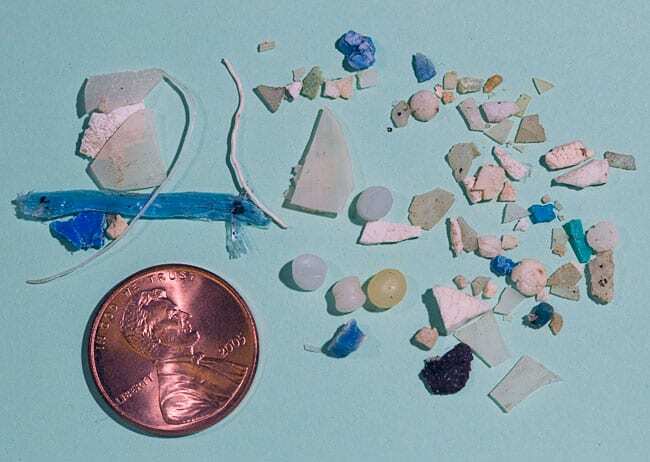 The plastic debris reached its highest density between about 22°N and 38°N latitude, and the highest value recorded during the 22-year period was 580,000 pieces per square kilometer at 24.6°N east of the Bahamas. The region, where 83 percent of all the plastic debris was collected, is known as the North Atlantic subtropical gyre, a part of the ocean bounded by a series of wind-driven currents, such as the Gulf Stream, that collectively flow clockwise around the subtropical North Atlantic. The findings supported a numerical ocean model developed by co-author Maximenko, who suggests that Ekman dynamics—a net movement of water to the right of the prevailing wind direction in the Northern Hemisphere (and to the left in the Southern Hemisphere)—would tend to concentrate floating material in the center of the gyre. Where do the plastics end up? “We still haven’t figured out this missing plastic problem,” said Reddy. 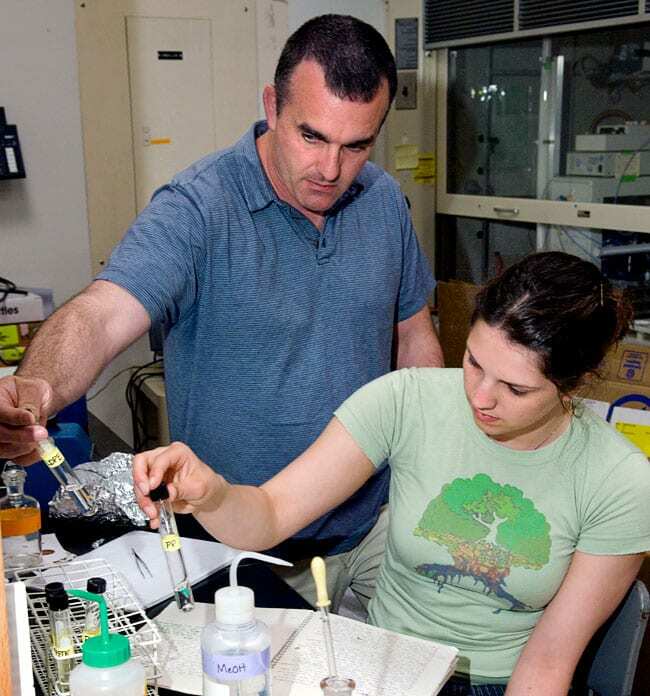 But in a first attempt to try, he, Morét-Ferguson, Law, Proskurowski, Peacock, and Ellen Murphy of WHOI analyzed the size, mass, and material composition of 748 samples of plastic collected on SEA cruises between 1991 and 2007. Their study, published online Aug. 17, 2010, in Marine Pollution Bulletin, offers new insights and raises new questions about what happens to plastics in the ocean. The vast majority of oceanic plastic debris collected at the sea surface was made of polypropylene and polyethylene, which are less dense than water. But their densities were higher than expected based on their chemical properties alone. Chemical reactions sparked by sunlight, combined with water turbulence, likely break these plastic pieces into fragments too small to be captured by the sampling nets, and perhaps change the density of the plastic itself, causing it to sink. The researchers’ chemical analyses showed that many plastic pieces have measurable amounts of nitrogen, even though nitrogen is not a component of the polymers that make up plastics such as polypropylene, polyethylene, and PET. That nitrogen could only have come from living organisms. Microbes may be taking up residence on the floating plastic debris, perhaps taking advantage of a new source of food, or perhaps using the plastic pieces as substrates on which to form novel microscopic ecosystems. 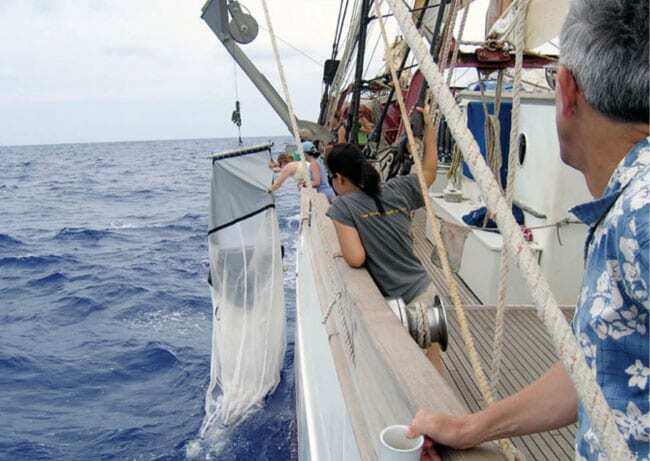 Researchers at SEA and WHOI are now investigating microbial growth on plastic samples obtained during the most recent summer SEA cruise aboard Corwith Cramer, which sampled a huge swath of the Sargasso Sea east of Bermuda—going halfway across the Atlantic to 40°17’W. The scientists are trying to isolate and identify microbial species on the plastics and in water samples collected during the cruise to help determine whether microscopic life uses the plastic as a food source, or merely as a raft. As for macroscopic life, it is common to find bits of plastic debris encrusted with marine organisms, such as algae, barnacles, and other invertebrates. Some communities are composed of species normally found in the open ocean, but other times, the community surrounding the plastic debris is unexpected. This past summer, for example, SEA crew members encountered a 5-gallon bucket carpeted with algae and other small organisms, but they also found an unusual community of about two dozen triggerfish that used the bucket as its base. Triggerfish are generally found in coral reef communities, but in this case, they were found more than 1,000 miles from the nearest reef. One triggerfish caught in the net along with the bucket had more than 40 pieces of plastic in its digestive tract. Plastic debris may block food passage or accumulate in marine organisms, but what happens to it after their death is yet another scientific mystery. The answers to these questions may depend on developing a reliable way to measure the age of plastic debris. Reddy said the two papers—in fact, the entire decades-long sampling effort—represent a substantial accomplishment for the SEA staff whose primary role is teaching, not research. The National Science Foundation supported the research to analyze the plastic data, but Law said that collecting the necessary data and long-term monitoring of oceanic conditions are too expensive for traditional government funding sources to undertake.